Shake the islands as Thump back and a buildable Chompy Bot 9000s clash on the battlefield with the Chompy Bot Attack by Mega Bloks Skylanders Giants. Build the Chompy Bot 9000s, sit the Red Chompy in the driver's seat and get ready for action against Giant Thump back. But armed with his Anchor Assault, Thump back won't back down from this monster machine with a Chompy missile launcher that really fires. All hail the whale and prepare for an epic showdown against the forces of Kaos. Ideal for kids age 5 and up. 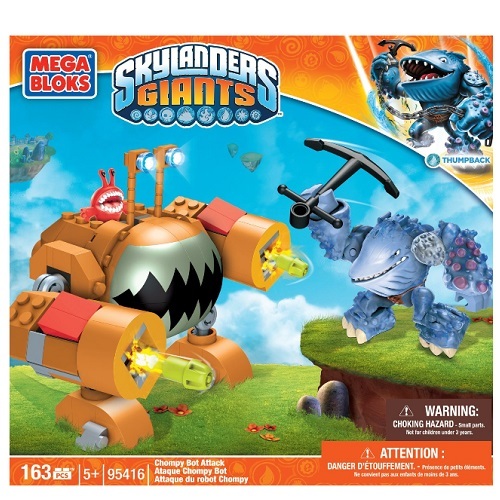 Don't delay- Get Mega Bloks Set 95416 Skylanders Chompy Bot Attack (Thumpback - Water Giant)!